The industrial supply company's yo-yo performance of late is largely down to sentiment over the U.S./China trade dispute and its possible impact on margins. Shares of industrial supply company W.W. Grainger (NYSE:GWW) went up 10.6% in November, according to data provided by S&P Global Market Intelligence. The rise comes as a continuation of a recovery from a significant sell-off after the company's third-quarter earnings report released in mid-October. In a sense, the move upward in November is a consequence of the ebb and flow of sentiment regarding the U.S./China trade dispute. CFO Tom Okray estimates that 20% of Grainger's U.S. segment cost of sales comes from product directly sourced from China and a 25% tariff would increase cost by 2% for the U.S. segment. There were hopes for a rapprochement between President Donald Trump and Chinese President Xi Jinping at the end of November, but the market was left unsatisfied with the results of the bilateral meeting between the two leaders in Buenos Aires. China matters to Grainger in terms of margin, something that is critically important for the investment case for industrial supply companies because they are typically seen as having the ability to expand margin in an upswing -- leading to revenue growth leveraging into profit growth. 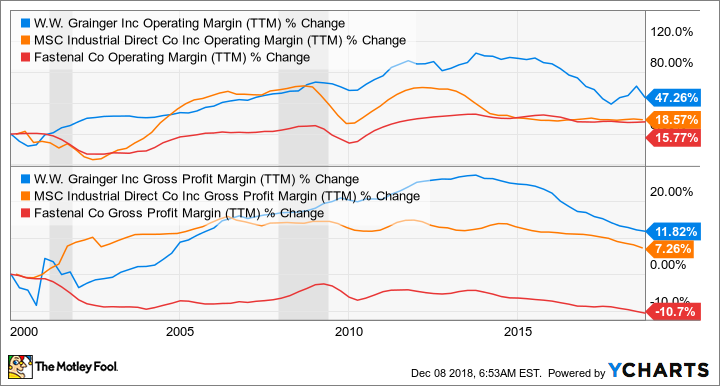 However, a quick look at margin performance at leading companies in the sector shows how they have struggled to raise margin in the recovery since 2009, particularly when compared with the last recovery. GWW Operating Margin (TTM) data by YCharts. Indeed, Grainger's disappointing margin performance was the reason for the slump in October. On a superficial level, there was nothing wrong with the third-quarter earnings report -- after all, according to CFO Tom Okray, the company is "trending to the high-end of our guidance" range of $15.05-$16.05 on an underlying basis. However, when Grainger reported a gross profit margin of 38.1% in the third quarter compared to 38.6% in the same period last year -- even as net sales grew 7% in the quarter -- it was cause for disappointment and the stock slumped. There are many reasons for this, not least being the encroachment from Amazon.com (NASDAQ:AMZN) entering the sector. In addition, Grainger has also had to deal with rising raw material prices causing suppliers to increase pricing and pressure margin in 2018. Throw in the China trade dispute at the potential impact on margin and it's just another thing to worry about. That said, Grainger has done a pretty good job of reacting to Amazon by cutting its prices and expanding its own online capability, and the stock is still up 22.5% on a year-to-date basis as I write. Looking into 2019, investors will be keeping a close eye on margin and management's commentary on the matter, especially with the ongoing trade dispute in mind.